You might call this my first foray into October theme blogging but it’s not my usual creepy type work but I think I’m saving that for deeper in the month before Halloween but rest assured it is coming. I’ve been use the song choice for this entry as a theme for a while but just couldn’t figure out the right time and place for it but it seems now I have. For this scene I combined a bit of new items, items I’ve used previously, and things that are recent but not new enough to be given that distinction. In a second straight entry, I put together several pictures besides my main storytelling photo to give different angles along with close-ups of items that aren’t as clearly seen (which I do to give you a better idea what they look like) so it might help you make a better informed decision on whether or not you may purchase an item. Sponsors for the blog that are being featured in this post are Avi-Glam and two different items from Go&See. Events that I’ve been to with items being shown here include Shiny Shabby, Men Only Monthly, and The Men’s Department. Before I put this entry to bed, just to let all of you know the Men Only Monthly event will close for the current round on the 15th of October so you still have a few days to check it out to see what’s available. Shiny Shabby will also close their current round on the same day which gives you an opportunity to grab a friend or your significant other or whoever you might want to take with you and make a day of shopping. For those of you that are reading thanks for stopping by and joining me on this adventure or any of my previous others that I’ve been on. I hope that you continue to follow this space as I continue to grow. Now that you’ve patiently waited through my rambling, here are the credits and I bid you adieu for now. This head has been around a while but this is my first time using it for a scene. Stanley has a more rugged look to him with certain skins and shapes and I’ve been known more for having looks that were less defined. I do certainly like the possibilities of combinations I can work with in the future so I consider this to be a successful experiment. As with using the head for the first time, I am using this shape which was created with Stanley in mind. I also combined it with the newest skin in the Go&See lineup which is at Men Only Monthly. I think it is a great combination and a little different from the majority of looks I go with but doing different things is a challenge that I’ll gladly accept. If you like diverse style as I do then Bakaboo is definitely a brand to keep an eye on. Creator Ocean Blackthorne’s approach at fashion is quite different from anything I’ve experienced. 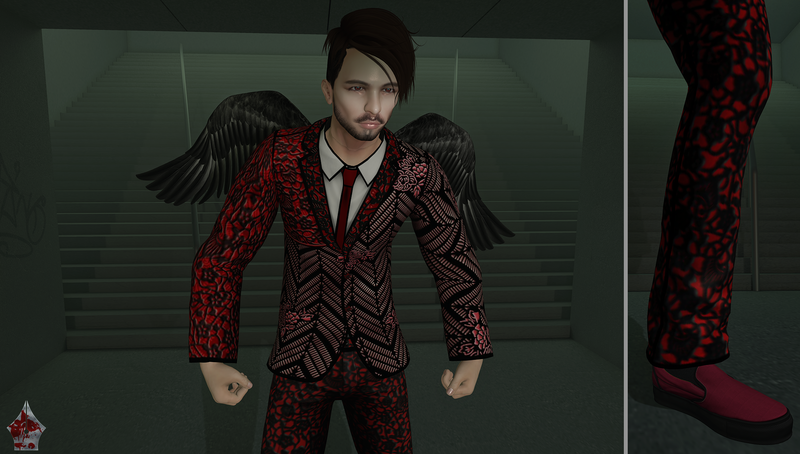 I’ve had my eye on the brand for a while and finally seeing this suit (which is sold separately from the trousers) I knew that I had feature it. Keep in mind that it is classic sizes (XS-XL) but with alpha cuts I am wearing the M size and I think it looks great. The second half of this ensemble and what more can I say that I haven’t already said. The whole outfit together certainly gives a new dimension to formal wear as far as suits are concerned. It’s certainly not plain by any means and definitely draws attention. The sizes are the same as with the suit jacket (XS-XL) and should work with most normal male mesh bodies but try a demo first just to be on the safe side. Normally I do not write anything about item’s I have previously featured but I did receive an updated version today which changed the layout of the HUD but there are not any new features or colors added. What better than a pair of wings for a fallen angel? These bento animated wings come with a HUD giving you five color choices so that you’re able to pick what best suits your mood. I like how detailed this product is and it was easy to time my shots with the animations so that made it a lot easier to work with. If you are into fantasy or role-play I’d recommend you check this out as I am very impressed. I needed a darker type background and I know ISUKA is one of my go to brands for backdrops. This stairway and hall combination was perfect for the scene I set up. If you are looking for something great to shoot a picture with there are a variety of different backdrops available at their store. Give them a look and see how your photography can be inspired. 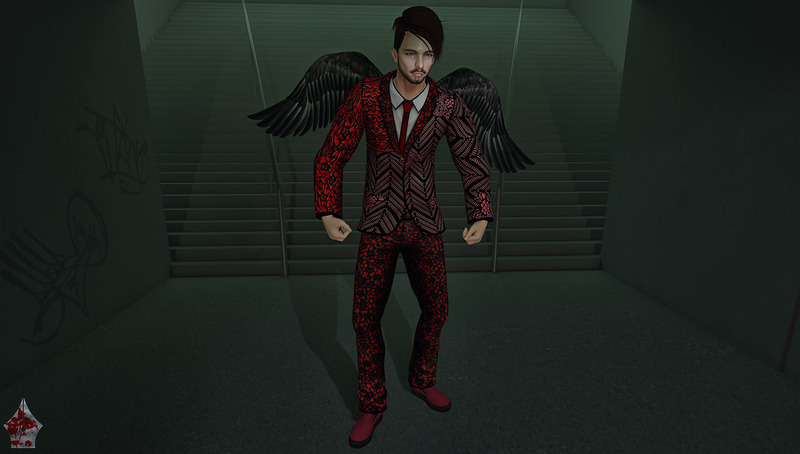 This pose set was originally for sale at the Hipster Men’s Event last month. I couldn’t really find an idea or inspiration where I could use these so I set them aside for when I could. K&S is a brand that I’ve been following for quite a while and have used a small but fair amount of their poses. I always seem to find something from them to use.